The following information was updated in December of 2014, and is all included in the official Palmdale Water District press kit (600KB pdf). For more information on any of the material found on our website, contact us. Palmdale Water District has compiled a selection of high quality images of facilities, board members, operations, and more for use by the press. The images are intended to accompany articles (either in print or online) about the District, and are offered freely for such purposes. They may not be used for any other purpose without the express, written authorization of Palmdale Water District’s Public Affairs Director, Judy Shay. The files are presented here for download as a zip file (46.5MB). To provide high quality water to our current and future customers at a reasonable cost. 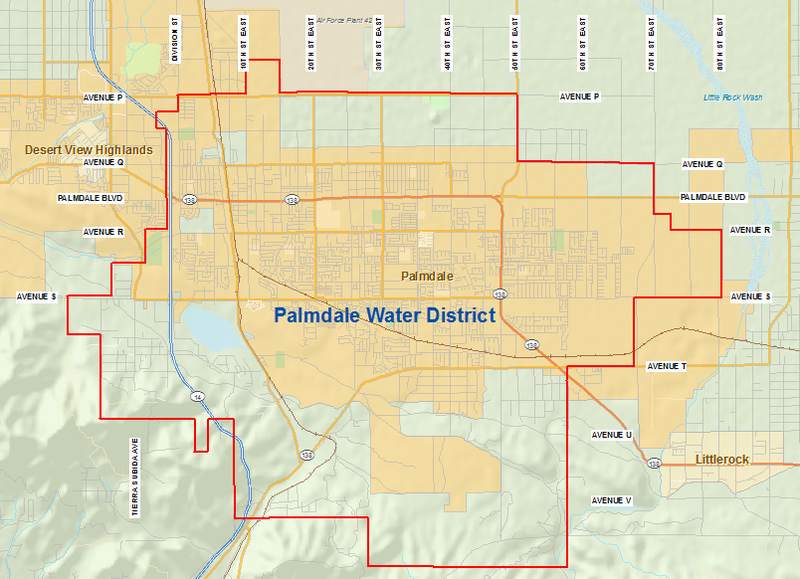 Residents who live within the boundaries of the Palmdale Water District receive their water from one of three sources or a combination of these three sources: Littlerock Dam, Water Wells, and the Leslie o. Carter Water Treatment Plant (LOCWTP). Read more about how water is delivered to our customers. Palmdale Lake holds about one fifth of the total water that customers use each year. When needed, the district is entitled to take up to 5.6 billion gallons of water each year from the California Aqueduct. Littlerock Dam reservoir is fed entirely by natural run-off from snow packs and rainfall. Well water pumped from as deep as 550 feet makes up approximately 40% of the Districts annual production. The Leslie O. Carter Water Treatment Plant can treat up to 35 million gallons of water per day. Recent upgrades enable the Palmdale Water District to remove a wide range of naturally occurring and man-made contaminants from the water. Read more about Palmdale Water District’s infrastructure. In the late 1800’s, the Palmdale Water Company dug the first irrigation ditch to divert water from Littlerock Creek. By the early 1900’s the Palmdale Water Company and the Littlerock Creek Irrigation District determined that a public irrigation district would be the best way to finance this construction of one or more dams. The Palmdale Irrigation District was formed in 1918 by a vote of the public. The construction of Littlerock Dam & Reservoir was completed in 1924. In the 1950’s the aerospace industry arrived in the Antelope Valley, shifting the focus of the area away from agriculture. By 1966, the District was providing only municipal and industrial water. The name was changed to Palmdale Water District in 1973 to reflect this new direction. In 1995 Littlerock Dam was renovated to improve seismic safety , and in 2009 the water treatment plant was expanded to allow processing of up to 35 million gallons of water per day. Read a more detailed history of Palmdale Water District. Palmdale Water District is governed by a five-member Board of Directors. With the District’s water service boundaries divided into five different areas, Directors are elected in odd years to serve a four-year term. Directors must live in the division they are elected to serve. Mr. LaMoreaux began employment with the Palmdale Water District in March, 1989 as the Assistant General Manager. He was promoted to General Manager in September, 1994 and served in that capacity until March, 2008. Working briefly for Rosamond Community Services District as Assistant General Manager and District Engineer, he returned to the Palmdale Water District as General Manager in January, 2010. As the General Manager, he is responsible for overseeing the District’s day-to-day operations and business functions according to the direction and policies established by the Board of Directors. His previous employment includes private engineering consulting firms in California and Wyoming where he was involved in design and inspection of a variety of projects. He is a native of Ohio, graduated from the University of Wyoming in 1984 with a B.S. Degree in Civil Engineering, and is a licensed Civil Engineer in California. An integral part of Palmdale Water District’s mission is to be good stewards with ratepayer funds and to be accountable for how those funds are used. Accountability is critical to our process. As such, we readily provide information relating to staff compensation, water quality, and strategic planning for the future of the District, all of which is available through our Transparency Center. The Conservation Department accomplishes the reduction in water loss, waste or use by the implementation of water conservation or water efficient measures. In addition to the many rebates offered by Palmdale Water District, occasionally we are able to offer specific programs to help residents conserve water. Currently, our efforts are focused on the Cash for Grass program. See before and after images of Palmdale homes that have swapped out their lawns for more water efficient landscapes. Offering education programs for school children is an important part of preparing the next generation to conserve water. Learn more about how Palmdale Water District is teaching our youth be good stewards of precious resources. Download the PWD Strategic Plan brochure.